Missing teeth is a common problem for many people, including Baltimore residents. Tooth loss is unavoidable for many people, and most of the time, it isn’t any fault of the person losing teeth. Whether it be poor dental hygiene that causes loss of tooth and bone, to facial trauma caused by any number of circumstances, tooth loss can afflict anyone at any time. The effects of tooth loss can be very severe. Not only does tooth loss cause issues with bone and gum tissue degradation, but the aesthetics of a damaged smile can seriously affect the personal and professional lives of sufferers. To solve these issues, replacing teeth is the only real way to recover a healthy and aesthetically pleasing smile. It’s quite simple to replace a single tooth, but replacing teeth when multiple teeth – or all of the teeth – are missing is more complicated, and options become limited. In the past, people missing all of their teeth had no option but dentures. 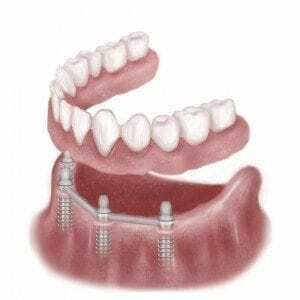 However, the professional oral surgeons at Maryland Center for Oral Surgery and Dental Implants have a new prosthetic option for Baltimore residents – implant supported bridges. They virtually stop the bone deterioration process. Adjacent natural teeth are not ground down into peg shapes or loosened. It is not necessary to cover the roof of the mouth so that food can be tasted. It restores the natural feel of biting and chewing. Relines and repairs are infrequent compared to traditional dentures. Implants are simply material that is placed into the bone of the jaw that not only provides support for the dental bridge, but it also simulates the structure of a tooth root. This implantation into the bone structure prevents the bone degradation that naturally comes from the loss of teeth. Simple implant retained dentures utilize a minimum number of implant support the dentures to provide stability and comfort. 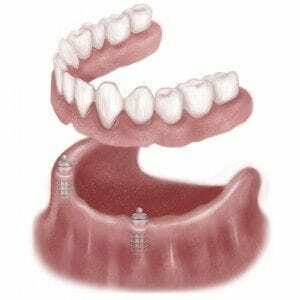 Implant bar-supported dentures use more implants and metal bars to provide even greater stability to the dentures. Dental bridges supported by implants provides function and aesthetics similar to natural teeth. They cannot, however, be removed like dentures. 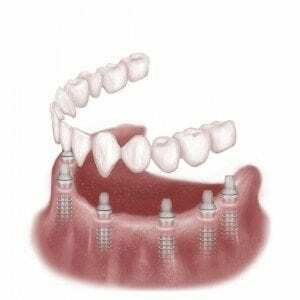 Familiarize the patient with the process of the implants. Create a custom treatment plan that is tailored to each patient’s needs. Make any changes to the regular process that can ensure the patient’s needs are fully met. Provide the patient with a detailed care plan to make dental implant supported bridges last as long as possible. Baltimore residents interested in replacing teeth with dental implant supported bridges are encouraged to contact Maryland Center for Oral Surgery and Dental Implants for a consultation by calling (410) 628-1839 today.